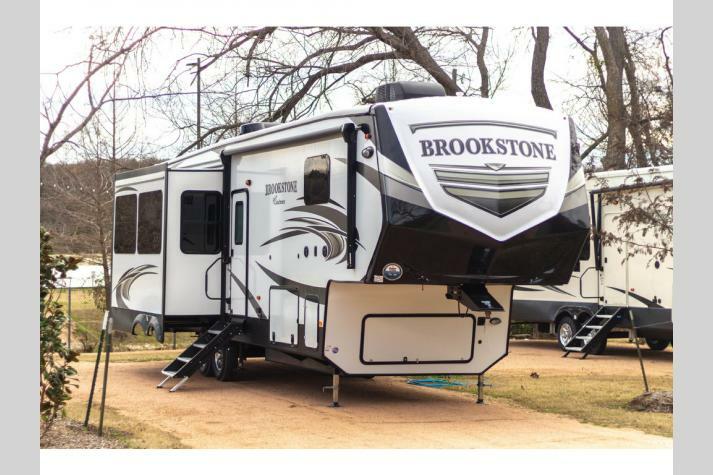 You will want to call this Brookstone fifth wheel home when your heart is set on a new destination somewhere in the great outdoors! Inside this unit, you will find thoughtful storage solutions in every location from the large front bedroom wardrobe with sliding doors to the linen cabinet in the spacious bathroom. There is also a nice sized kitchen pantry, as well as loads of overhead cabinetry for all of your belongings. 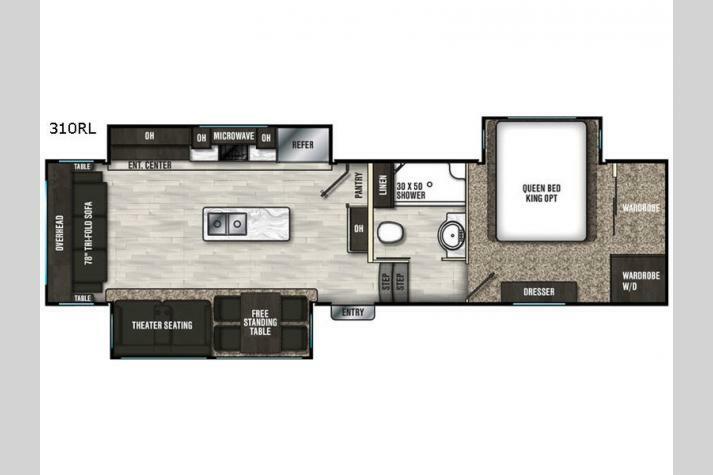 With everything neatly tucked away, you are left with a spacious and inviting layout that resembles home thanks to the free-standing dinette with four chairs, kitchen island to make meal prep super easy, and a large 30" x 50" shower with seat in the bathroom. Your private master bedroom provides a quiet retreat away from the living area where you can come and relax during the day and enjoy a great night's rest on the queen bed that slides out to provide extra foot traffic space for getting dressed. If you like, you can add the optional washer/dryer convenience for those extended stays when you call this Brookstone home for a few weeks at a time! Any Brookstone fifth wheel will have all the comforts that you desire for camping. Each newly redesigned high-profile wide-body provides a quality build that allows you to explore and enjoy any surroundings that you choose without compromise. On the outside, you will appreciate the vacuum bonded and aluminum framed sidewalls with rot proof Azdel panels, Weather Shield protection for both extreme hot and cold temperatures, and Dexter EZ-Flex suspension for a smooth tow. Parking will also be a breeze with the Turn-Tec engineering that is short-bed friendly. From the inside, enjoy beautiful views through the extra large windows that bring nature right in next to you. You will also find a well appointed kitchen with stainless steel appliances, granite/marble-style countertops, and storage in all the right places. Each meal for your family, or the entire gang when they drop by, will be as easy to prepare just like at home. While relaxing inside, enjoy residential furnishings, a Black Label pillowtop mattress, and a 55" LED living room TV with fireplace below. 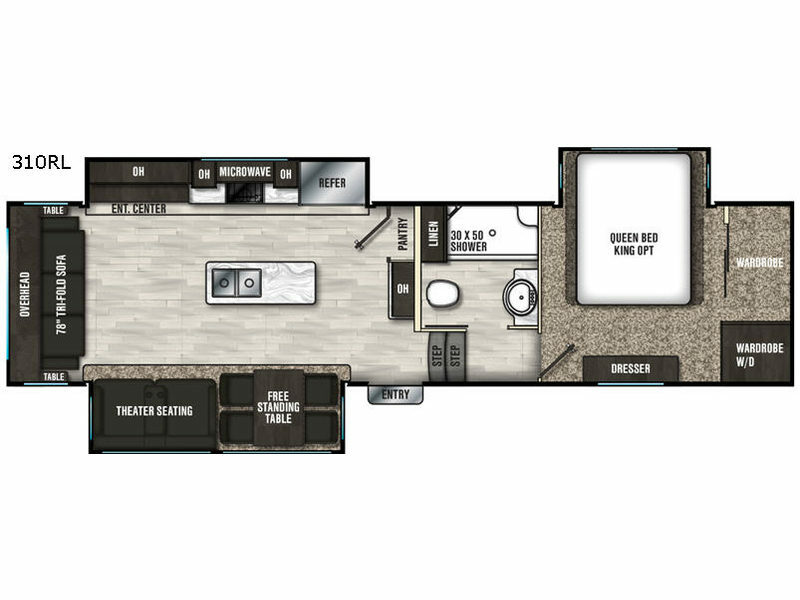 Don't wait any longer for your dream vacation, get it anywhere you park a new Brookstone fifth wheel featuring all the detail and comfort that you've been waiting for!